In the rush to condemn the so-called ‘Bedroom tax’ some commentators have been tempted to down play the problem of overcrowded housing in England. Using the so-called ‘bedroom standard’ (more details on that measure here) there were, at the time of the last census, over a million households living in overcrowded accommodation. This is a serious policy problem. Living in overcrowded accommodation is bad for your health and your wellbeing. There are at least three things worth bearing in mind about overcrowding in England. 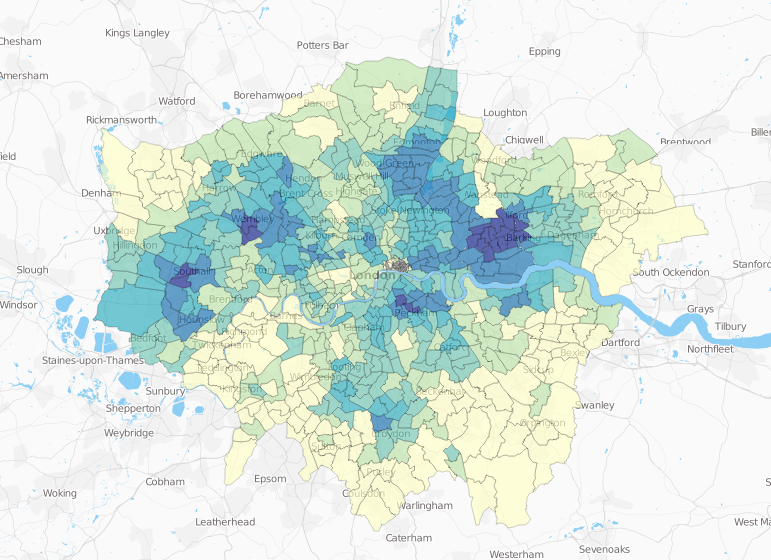 This map (made from the census data here) shows overcrowding in different neighbourhoods of London. The darker the colour the more overcrowding there is. In some areas of Newham nearly a third of households are overcrowded and the problem is not restricted to East London. While people often claim that there is only a housing problem in London and the South East, this is not the case with overcrowding. This map shows overcrowding in England. 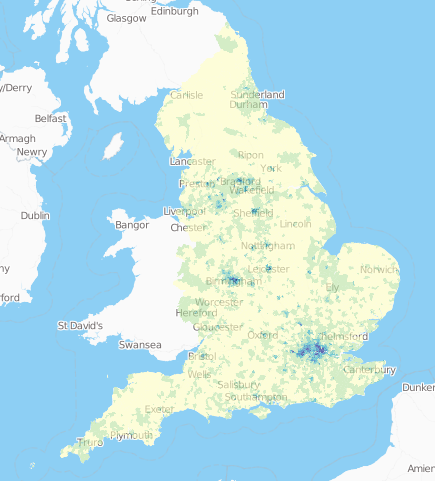 You can just about see that there are darker coloured sections in most towns. For example, here is a map of overcrowding in areas of Birmingham. And even Stoke-on-Trent (which has quite affordable housing by English standards). As you can see from these maps, while cities outside of London do not have as systemic a problem with overcrowding as the capital, it is still a problem for a sizeable number of people in different neighbourhoods of our major cities. Over 20% of households in Washwood Heath in Birmingham are overcrowded and 13% in Hanley Park in Stoke and Burngreave in Sheffield. A large part of the solution to this problem, as to quite a few housing problems, would be to build more houses. Having said that, there are a large number of under used houses, even in areas with a large number of overcrowded households. 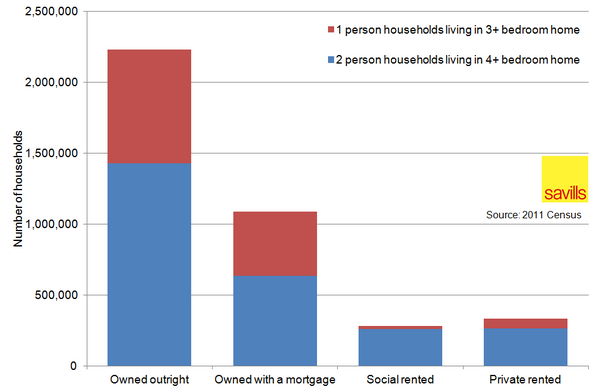 In Green Street East in Newham over 10% of houses have 2 or more spare bedrooms, while 35% are overcrowded. 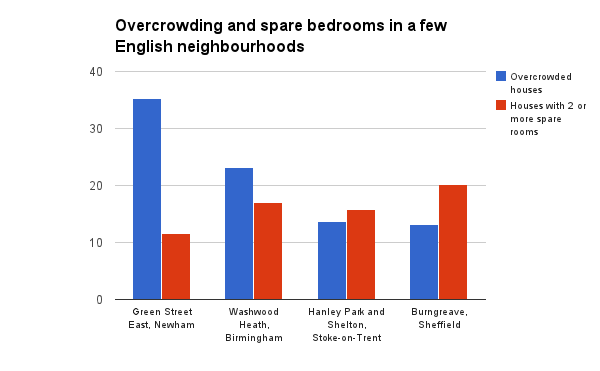 In Washwood Heath in Birmingham 23% of households are overcrowded while 17% have 2 or more spare bedrooms. In Hanley Park in Stoke and Burngreave in Sheffield there are more houses with spare bedrooms than there are overcrowded houses. The problem for those who have proposed the so-called ‘bedroom tax’ as a solution to overcrowding is that most of the houses with spare bedrooms in are not social housing they are privately owned, as this chart from Savills makes clear. If we want to solve the problem of overcrowding without building new homes in inner cities but instead by making sure all the bedrooms in larger houses are used, we would need to think about how we can encourage home owners to use their spare bedrooms. This entry was posted in Article and tagged bedroom tax, housing, overcrowding, public policy by Thomas Neumark. Bookmark the permalink.